One thing that is true of the promotional products industry is there are literally THOUSANDS of products! It’s easy to search and search for the perfect idea with so many choices, which can get a bit overwhelming. That’s where we come in. We sort through the latest ideas for 2015 and organize them into categories to make it easier for you to find what applies to your school and organization. We did just this with our notes and pictures from the PPAI Expo to highlight several trends and top promotional ideas for admissions departments. New products for college admissions. Starting at the top left, we’ll discuss how each promotional idea relates to admissions marketing. Custom Imprinted Box – 3D direct mail really makes a statement. We’ve seen some creative admissions acceptance mailings, and we think a custom imprinted box would be a fun way to say, “You’re IN!” For a smaller sized mailing, we especially like the Greeting Cube, which can be imprinted on both the inside and outside of the box. A higher value mailing could also be used to target specific student populations at various stages of the enrollment funnel. 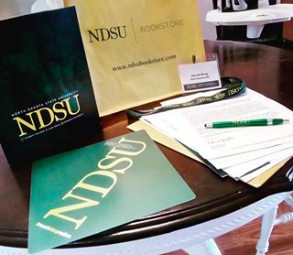 According to the Direct Marketing Association, 3D mailings receive a 250% better response rate than standard mail, so it’s a great way to keep prospective students engaged with your school. For more direct mail ideas, see our Direct Mail Showroom. Mini Polaroid Camera – as we talked about in Help Students Picture Their Future at your School, a Polaroid camera would be a fun way to instantly provide a picture to a prospective student visiting campus. Tech Tattoos – These ultra removable decals are an inexpensive, safe and easy way to personalize electronic gadgets. The stickers are designed for laptops, tablets, e-readers, cell phones, music players, game consoles, and more. 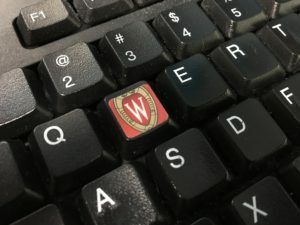 People love to show school spirit on their devices, making these tech tattoos ideal for prospective students (either in a direct mail piece with information or an event handout). 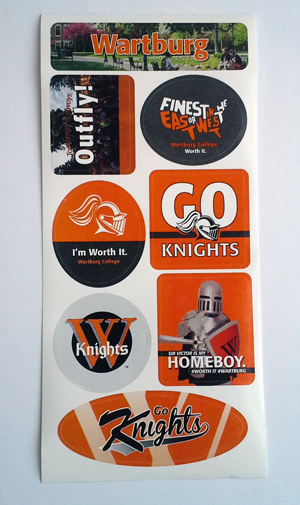 We also would recommend custom sticker sheets, such as the ones Wartburg College created with us. Luggage Tag – These high quality, embroidered luggage tags are a favorite idea for admitted students. It could easily be used in a get ready to “pack your bags” and come to our school themed event or mailing. Custom Pen Holder – Do you have a landmark on campus that would make a fun, custom pen holder? This is a unique idea for high school couselors. There are so many options – check out the catalog here. Desk items are a gold standard among promotional products, meaning your brand gains more exposure when its displayed on a desk. DigiClean Mailer – We’ve written about the DigiClean many times (NACAC Top Products, DigiClean Testimonials, as one of our most popular tech screen cleaning promotional items. DigiClean products come affixed to a direct mail card, so additional school information can be promoted on a larger space than the DigiClean itself. DigiClean and DigiGrip are items that literally “stick around” and resonate with tech-savvy prospective students. Click here for a link to the DigiClean Showroom. Which items are you most interested in for your school or college? 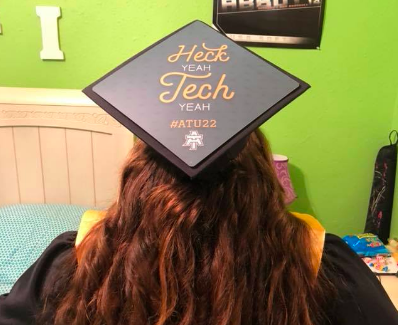 Let us know if you’ve seen any unique promotional products that colleges are using in the comments below. Looking for more product ideas? 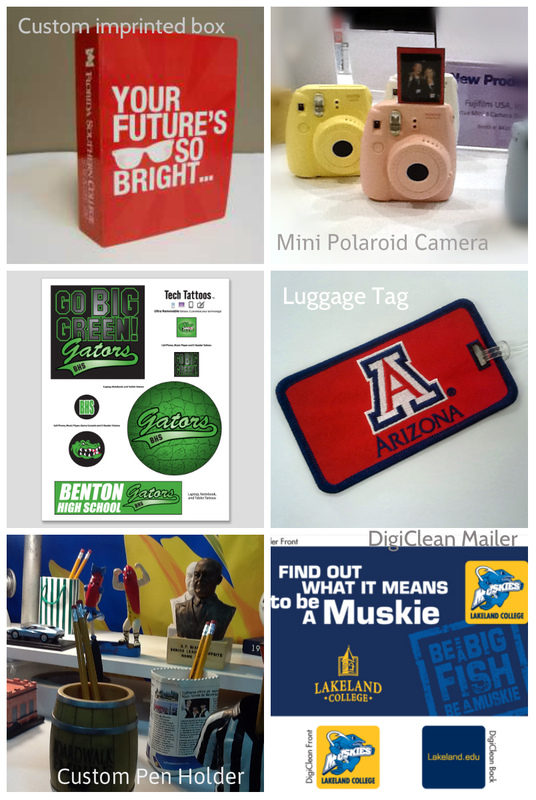 See our Top New Promotional Products for Colleges blog post.